The second AIPS Sports Media Awards has been launched at the Accra City Hotel in Accra, Ghana by Hon. Isaac Kwame Asiamah, the Minister of Youth & Sports during the 6th AIPS Africa Congress. Madam Evelyn Watta, the AIPS Vice President from Kenya gave a background on the Awards which had been previously won by Ghanaians like Fiifi Anaman and Anas Aremeyaw Anas, the popular investigative journalist. According to Evelyn Watta, there is a cash prize of $8,000 for the first place winner, $3,000 for second and $2,000 for the third placed. She said sports journalists from all over the world can submit their published best works between September 2018 and October 7, 2019 for consideration. She expressed that Ghana has some of the best performers in boxing football and media, so Africa is always proud of Ghana for its contribution to the development and promotion of sports in Africa. Hon. Isaac Asiamah in his address said he was honoured to be part of the 6th AIPS Africa Congress which Ghana was hosting for the first time, and hoped the nation will use such opportunity to deepen cordial international relations and foster unity and cooperation among participating nations. He said “sports development and promotion is influenced by widespread belief that sport can contribute to a range of social and economic benefits, like promotion of health, crime reduction, job creation, fostering of social and national integration, deepening of democratic practices, women empowerment, youth engagement, development of leadership qualities, respect for the rule of law as well as international cooperation, understanding and peaceful co-existence”. He noted that governments see sports not as a luxury, but important national investment in the present and future and a tool to globalize the world into a united peaceful nation. He expressed that sports is the most discussed subject in Ghana and most African countries, which the press setting the agenda in most cases leading to conflict. “The sports press should be circumspect in their reportage” he advised. Hon. Asiamah said the AIPS Africa Congress can help salvage the integrity of sports by promoting a discourse on how to de-emphasize the attitude of ‘win at all cost’ and rather project and promote sport as an effective tool for the development of individuals and nations. He announced that Ghana will host the first African Sport Governance Conference in Accra in September 2019 to address the challenges of governance in African sports from grassroots to elite. He named some of those to attend as academicians, sport experts, traditional leaders, governments and private entities to launch the ‘Clean Sport Campaign – Africa Edition’. He observed that sports press consist of print and electronic media and professional sports photographers and suggested the Sports Writers Association (SWAG) should be changed to Sports Press Association of Ghana (SPAG). Mitchell Obi, the AIPS Africa President said success happens when great minds meet, and he was happy with the heavy attendance to the opening ceremony. He explained that AIPS which was founded in 1924 in a boxing ring is the umbrella that gives professional grinding and support to sports journalists. “AIPS presents solidarity, fraternity, excellence, good habits, leadership and governance for the people” he stressed. He commended the executives and members of SWAG for holding the forts to mark 50 years of existence, and urged the media to promote the Power of Sport, which does many good and positive things. Kwabena Yeboah, President of SWAG said the association specially decided to host the Congress to mark the Golden Jubilee and thanked all the past presidents like 90 year old Joe Lartey, Oduro Kwarteng, Oheneba Charles, Joe Aggrey, Ebo Quansah and Ackah Anthony. He said the AIPS is strong and getting stronger, and the Congress will look as issues that affect the growth and development of sports on the continent. He thanked the Accra City Hotel and Alisa Hotel as well as the Ministry of Youth & Sports for supporting the programme. Ben Nunoo Mensah, President of the Ghana Olympic Committee (GOC) in a solidarity message said hosting of such international events comes with a cost and much hard work and commended the SWAG leadership and organisers. He expressed that Ghanaians cherish the SWAG Awards and their activities. 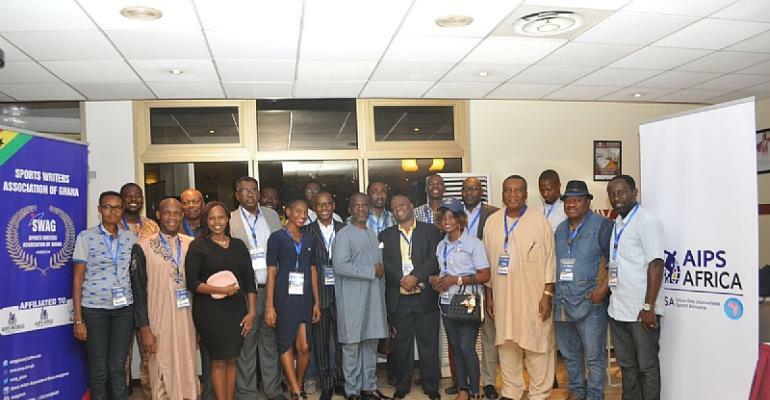 On behalf of the sports federations and the GOC, he wished AIPS Africa a successful Congress. Chuku Momah, former President Confederation of African Tennis (CAT) and Nigeria Tennis who was a guest presented a book he has written to the Minister of Youth & Sports and the SWAG President. AIPS also presented a plaque from President Gianni Merlo to the Ghana Sports Minister. Delegates from 25 African countries are attending the Congress.